Right: Tania Isaac, with Eve, on the barre, and Naomi, underneath the barre, in the dance studios of Drexel University. By Jonas Gustavsson, Courtesy Isaac. In a way Kronenberg’s delivery mirrors the experience of having children as a professional dancer: You can never really predict or be prepared for how your life will change. 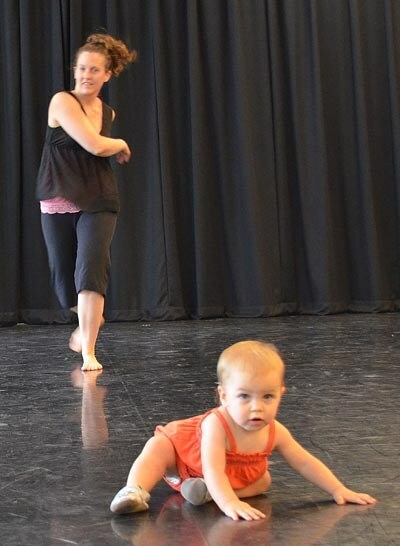 Yet more and more dancers are choosing parenthood and continuing to perform or choreograph. The key, these artists say, is embracing the ups and downs and learning to adapt. In doing so, they’ve found their lives enriched not only by the presence of their children but also by a fuller, more rewarding career. The first challenge of having a baby as a dancer is deciding when. Heather Olson, a New York City choreographer and veteran member of Tere O’Connor Dance, admits she worried about taking time off, since a dancer’s professional life can be brief. “I had a feeling I was at a really good place in my career and nervous about cutting that moment short,” she says. 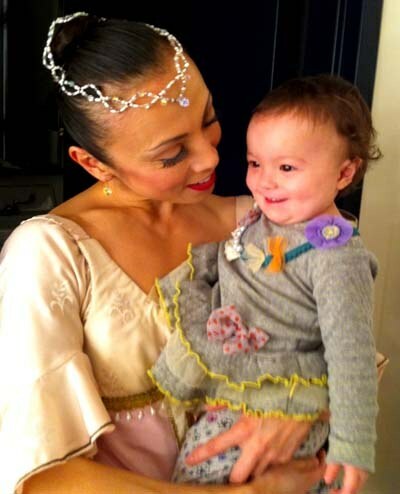 Left: PNB's Kaori Nakamura, backstage with Maya, during Jean-Christophe Maillot's Roméo et Juliette. Photo courtesy Nakamura. Such determination comes naturally to many dancers. Take Pacific Northwest Ballet principal Kaori Nakamura. She always knew she wanted to be a mom but assumed she’d wait until she retired. “But when I turned 40 I realized I still want to dance and I still can dance, but at the same time 40 is getting old to have a baby,” Nakamura says. “So that’s when I decided I’ll have a baby and then come back.” And three months after her daughter, Maya, now 2, was born she performed the grand pas de deux from A Midsummer Night’s Dream. The decision to have a baby can be even more daunting for freelance artists, especially when things don’t go as planned. Tania Isaac, a dancer/choreographer and assistant teaching professor at Drexel University in Philadelphia, had to cancel a tour with Rennie Harris because she was so sick while pregnant with her first daughter, Naomi, 9, and was bedridden for eight months with her second, Eve, 2. Right: Lori Yuill shares the studio with Lola. Photo by Emily Marcel Theys. Above: Healther olson with Lake at the Maggie Allesee National Center for Choreography, Florida State University. Photo by Carol Ann Olson, Courtesy Olson. Then there’s the enemy of all new parents: exhaustion. “It’s difficult to rehearse when you’ve been up for most of the night,” says Olson—noting that you quickly learn to do more with less. “I used to push really hard, but now I’m learning how to ride the physics of what I’m doing. I’m learning how to be more efficient, and strangely enough it’s improved my dancing.” Less energy also means less negative energy, which can have unexpected benefits onstage. Nakamura says she doesn’t get as nervous before performing with the perspective her daughter provides. Above: MCB's Jennifer Carlynn Kronenberg shows Eva how to tie her ribbons. Photo by Carlos Guerra, Courtesy Kronenberg. If there are other dancers with kids in your company or project, hire one babysitter to watch the group and split the cost. Have an hour off for lunch or a lag between rehearsals and live close by? Head home for a midday visit with your baby. Accept the fact that you’ll rarely be able to arrive early to warm up before technique class or squeeze in that extra strength-training session. Beating yourself up about it will only make you less productive in the studio. 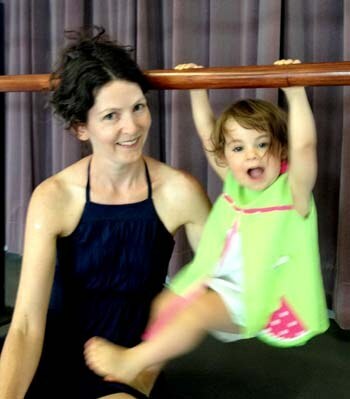 A New York dance writer, Elaine Stuart is expecting her first child in December.